It's not too late to pull together a plan for a fabulously fool-proof Valentine's Day. Whether you'll be celebrating as a family or as a couple, I've got some off the beaten path ideas that will have your heart fluttering. Get a roaring fire going and spread out a big blanket on the floor. An indoor picnic is the perfect option for any budget or number of people. Go high-end by serving a nice wine, gourmet cheeses and crackers, grapes, and fancy Belgian chocolates. Or for a more wallet and family-friendly picnic, serve heart-shaped PB&J sandwiches, fresh fruit, whole-grain crackers and pretzels, and a fun dessert. Cupcakes are a big hit with the kiddos. A picnic is perfect for breakfast, lunch or dinner. It is a great way to celebrate with the family or alone and doesn't have to be expensive. My husband and I stopped going out for Valentine's Day dinner a long time ago. The restaurants are over crowded, serve overpriced, prix fixe meals, and service is fair, at best. Once we had our children, we wanted to include them in the celebration. So, we started going out for breakfast or serving a special morning meal at home. Heart-shaped pancakes served with red fruits (strawberries and raspberries) are perfect for this occasion. Adults can enjoy mimosas (or other Champagne cocktails) while lingering over a relaxing meal. Celebrating early in the day with the kids allows time for mom and dad to have a quiet celebration after the kids have gone to bed. If pampering and relaxing with your Valentine are your thing, then check out a spa near you. Most now offer couples' packages for the day including a light lunch. Hmmm....sounds nice. I've noticed this year, that many local New Jersey wineries are offering special Valentine's Day weekend tastings...complete with chocolate. Hello. Did someone say wine and chocolate in the same sentence?? If you are lucky enough to live within a reasonable driving distance to a winery, check it out. The tastings are very reasonably priced at about $10 per person and often include a tour of the cellar. Once you have children, it's often difficult to remember the couple you were before the kids came along. Put the the kids to bed. Crack open a bottle of wine and turn on your favorite channel on Sirius. It's time to chill with your Valentine and reminisce about why you fell in love in the first place. Recall details from your first date or when you first met or maybe even your first fight (lol). Break out the old pictures and remember special trips you've taken and special occasions. It's an opportunity to reconnect in our otherwise busy worlds. 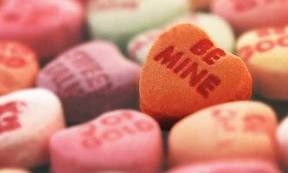 However you choose to spend it, Valentine's Day doesn't have to be an over-commercialized holiday filled with cliches. It's never too late to start a Valentine's Day tradition by doing something new!